Home HipHop Music New Music Nexxlegacy MC Lyte Tops the Charts with New Single "Dear John"
MC Lyte Tops the Charts with New Single "Dear John"
MC Lyte Tops the Charts with New Single "Dear John,"
LOS ANGELES (October 7, 2014) -- Legendary BET Lifetime Achievement Award Winner MC Lyte continues to blaze trails with her first chart-topping single in eleven years, "Dear John," featuring Common and 10 Beats (the first release from MC Lyte's upcoming LP, which is slated to be released later this year). 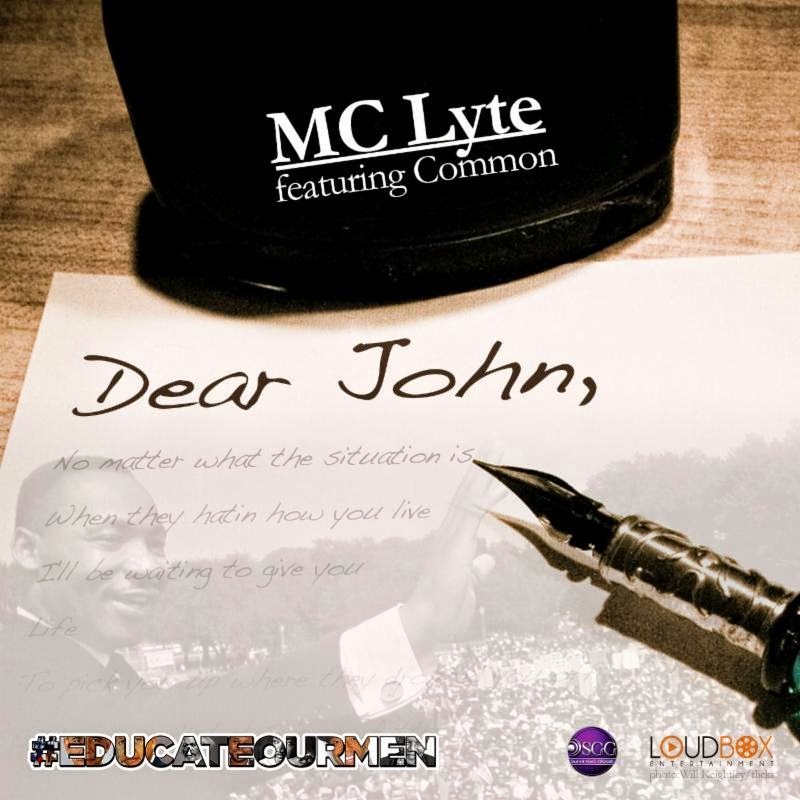 "Dear John" (listen at www.mclyte.com) is the anthem for #EducateOURMen, which is the signature scholarship initiative of MC Lyte's Hip Hop Sisters Foundation, which has presented two $100,000 university scholarships during the Soul Train Music Awards Red Carpet Pre-Show each year since the organization's founding. This year, the foundation will present scholarships earmarked to send men of color to Dillard University (www.educateourmen.info). Hip Hop Sisters Foundation is also beaming with the appointment of its new interim Executive Director, Monica Newman McCluney, who comes to the organization with a strong background in leading educational, corporate, and philanthropic programs and initiatives. In her role, Monica will further develop HHSF's growing base of national partnerships through innovative programs, increased brand presence and new initiatives. "The single 'Dear John' is just the beginning of our mission to infiltrate the musical airwaves and tell the story we want to see with language of empowerment. #EducateOURMen is a timely campaign that will engage holistic methods to empower our men and heal people of all cultures in our nation and world. I am excited about partnering with Common and 10 Beats on the single and with Russell Simmons, Jeff Johnson, Dr. Damon Williams, Kenny Lattimore, Dr. Benjamin Chavis, Malcolm Jamal Warner, Dillard University President Dr. Walter Kimbrough, and other members of our advisory board as we expand the reach and impact of this important initiative," says Chairman and Founder MC Lyte. The MC Lyte #EducateOURmen Scholarship is open to high school seniors applying for fall 2015 admission to Dillard University. "Dillard University is pleased to be a partner with MC Lyte and the Hip Hop Sisters Foundation. Her desire to educate our men is consistent with the work we've done at Dillard, not just on campus, but in the broader community," beamed Dr. Walter Kimbrough, President of the prominent HBCU in New Orleans, LA. Applications for admission to Dillard University must be submitted no later than December 31, 2014. Initial scholarship winners will be announced during the Red Carpet pre-show at this year's Soul Train Awards in Las Vegas, NV and additional winners will be announced during signature events and awards shows in the first and second quarters of 2015. Jada Pinkett Smith, Faith Evans, Kelly Price, Salt, and Nicci Gilbert are just of the few celebrities who support the foundation's movement (www.EducateOURMen.info). About the foundation's new leadership appointment, President and CEO Lynn Richardson, who has run companies for Russell Simmons, Les Brown and others, says "as we develop and grow the foundation's signature programs, initiatives and infrastructure, we recognize the need to hire an accomplished executive like Monica McCluney to strengthen our existing platforms and provide the creativity and innovation we aspire to deliver in fulfilling the organization's global mission. She knows what corporate America wants, she is a skilled relationship builder, and she has proven experience both nationally and internationally in developing sustainable strategies that will take our organization to the next level." Hip Hop Sisters Foundation will continue to work with partners like BET, Centric, All Def Digital, Global Grind, Sigma Gamma Rho Sorority, Inc., the Women in Entertainment Empowerment Network (WEEN), and the Hip Hop Summit Action Network to advance its global mission and related goals. Monica Newman McCluney boasts more than 18 years of community relations and fund development experience and has played key roles in major strategic initiatives for a variety of organizations, including United Parcel Service, Bank of America and the national office of the NAACP. Monica is certified as an expert in Philanthropy and Education for TV, Print and Radio through the NewsCertified Exchange and is a graduate of Leadership North Carolina and the American Express Non-Profit Leadership Academy. For the past seven years, Monica has served in a senior leadership capacity with two of the nation's leading minority education organizations and was responsible for a portfolio of strategic partners, including corporations, media, government agencies, non-profits, associations, celebrities and their foundations. Monica directed sponsorship efforts for the UNCF's "An Evening of Stars" and the organization's national corporate relations efforts. Some of the highlights of her career include iLEAD South Africa, a global youth empowerment and education platform and the nationally-recognized UNCF Empower Me Tour, both of which she developed, launched and executed.